Japan’s fifth HTV cargo freighter completed a five-day flight to the International Space Station on Monday, making a glacial laser-guided approach to the complex with a 9,500-pound package of food, spare parts and experiments. Astronauts will not consume the samples, which were provided by Japanese distiller Suntory, but the spirits will be stored aboard the space station and returned to Earth for analysis. Japanese astronaut Kimiya Yui took control of the space station’s 58-foot robotic arm and latched on to the free-floating HTV supply ship at 1028 GMT (6:28 a.m. EDT) as the complex soared 250 miles over the coast of Brazil. A few hours later, the robot arm positioned the 33-foot-long HTV cargo craft on the Earth-facing port of the space station’s Harmony module, where 16 bolts drove closed to firmly attach the visiting spaceship to the massive orbiting research lab. In the coming days, astronauts inside the space station will unpack more than 8,000 pounds of cargo packed inside the HTV’s pressurized cabin. The equipment includes food to restock the space station’s pantry after a series of resupply missions failed to reach the complex in recent months, forcing the crew to delve into the station’s reserve stockpile more than NASA managers prefer. Other critical components delivered by the HTV mission, which is nicknamed Kounotori 5 — the Japanese word for white stork — include filtration beds for the space station’s water processer, a major part of the lab’s closed-loop life support system which changes waste water into potable water. With supplies delivered by the HTV, the space station’s six-person crew has provisions to stay aboard the complex into early 2016, NASA officials said. 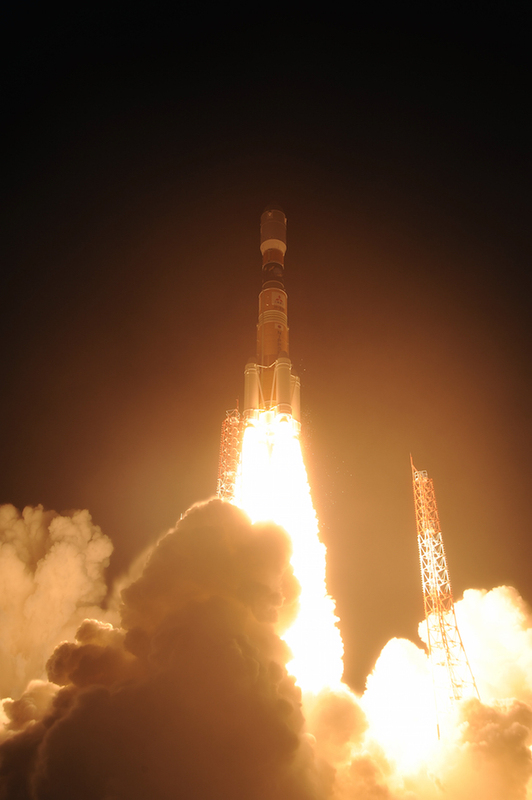 The Japanese supply freighter arrived at the station five days after a successful launch aboard an H-2B rocket from Tanegashima Space Center in southern Japan. 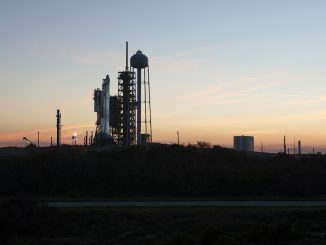 The breakdown of the supply load includes 3,101 pounds of crew supplies, such as food, clothing and items to restock the space station’s pantries. Another 2,753 pounds of gear will support the space station’s research regimen, focusing on how the human body responds to extended stays in orbit and the behavior of super-hot melts in microgravity. The experimental hardware includes a high-temperature furnace and a platform made by NanoRacks to host commercial payloads on an exposed facility outside the space station. A package of CubeSats strapped inside the HTV will be ejected from a special deployer mounted on the end of the station’s Japanese robot arm in the coming months. A refrigerator-sized rack designed to host future small plug-and-play research payloads will also be transferred over to the space station from the HTV’s cargo compartment. The HTV is carrying 172 pounds of spacewalk equipment and 119 pounds of computers, printers, batteries and chargers. The remaining 1,915 pounds of cargo inside the HTV’s internal cabin are parts to maintain and improve the space station, including a new galley conceived to be a one-stop location to help crew members prepare meals. 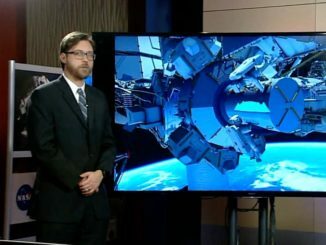 “A lot of times the ISS is described as a four-bedroom house or a five-bedroom house, and that’s very true, but the one thing the ISS doesn’t have is a kitchen,” said Royce Renfrew, NASA’s lead flight director for the HTV 5 mission. “It has the ability for the crew to get water out of a potable water dispenser in the lab. There are suitcase-sized food warmers that are scattered around, there are a couple of what are called MERLINs, which are refrigerators where they can keep their food cold when they want it cold. But it’s not all consolidated in one space. A 1,460-pound astrophysics sensor designed to search for elusive evidence of dark matter is latched inside the HTV’s external cargo hold. 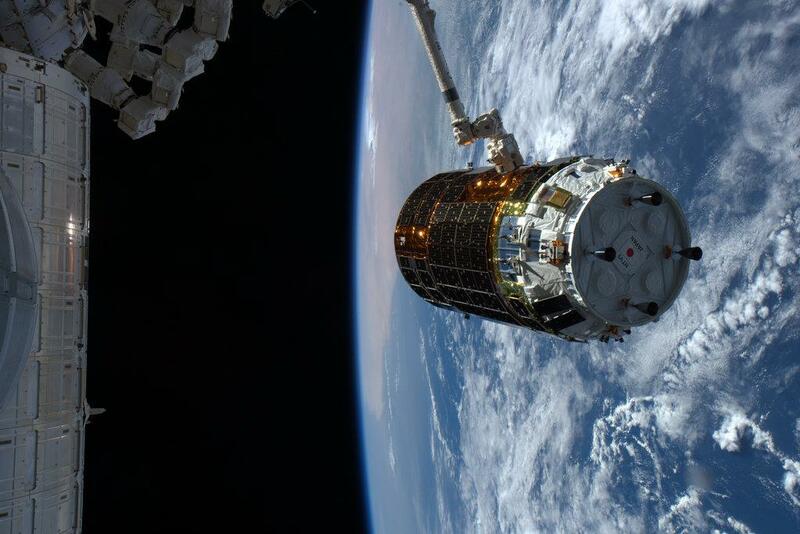 The station’s robotics systems will transfer the dark matter instrument to a port on the Japanese Kibo laboratory’s exposed experiment platform shortly after the HTV’s arrival. Led by Japanese scientists, the Calorimetric Electron Telescope, or CALET, instrument will search for sources of high-energy cosmic rays in local regions of the Milky Way galaxy. Researchers hope data from the sensor will include signatures of dark matter, the unexplained material that makes up more than one-quarter of the universe. “To ascertain the existence of dark matter, electromagnetic waves flying about in space, as well as cosmic rays and high energy gamma rays (both rays hold energy with much higher than these of ultraviolet rays and X-rays) should be closely examined,” explains an overview of the CALET experiment on JAXA’s website. Scientists expect the cosmic ray detector to operate between two and five years. 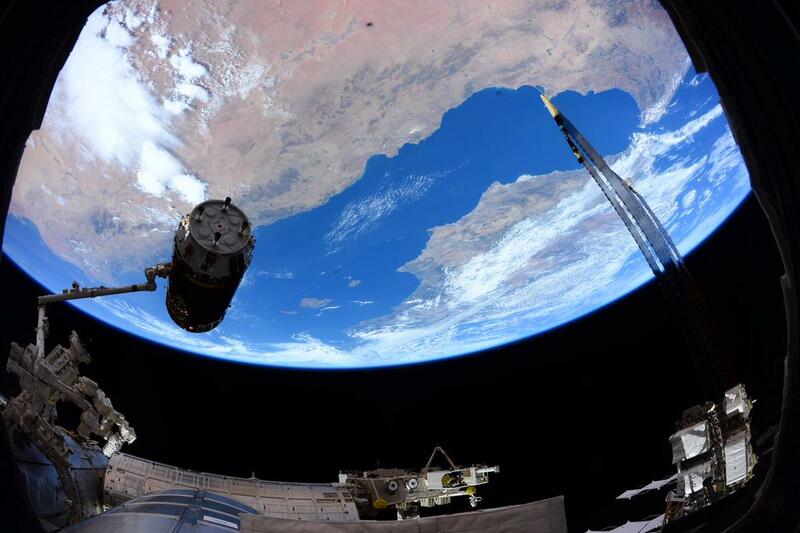 The HTV will remain attached to the space station until the end of September, when it will depart and head for a destructive re-entry over the South Pacific Ocean with trash from the space station. The cargo ship will also crash back to Earth with several experiment platforms mounted to the outside of the station, including a U.S. military science payload launched in 2013 and a Japanese instrument launched in 2009 that measured the composition of Earth’s stratosphere from orbit. The experiments are at the end of their lives and were assigned for disposal at the conclusion of the HTV 5 mission. The HTV’s rendezvous with the complex comes nine days before an international crew of cosmonauts and astronauts is set to dock with the station aboard a Russian Soyuz spacecraft. Commanded by veteran Russian cosmonaut Sergey Volkov, the three-man crew will blast off Sept. 2 from the Baikonur Cosmodrome and dock with the space station about six hours later. 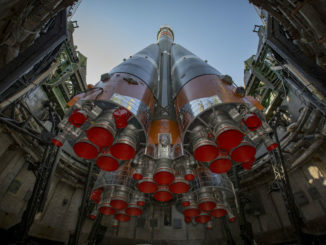 Volkov’s rookie crewmates — Kazakh cosmonaut Aidyn Aimbetov and European Space Agency astronaut Andreas Mogensen — will remain in orbit 10 days and return to Earth in a separate Soyuz capsule with outgoing space station commander Gennady Padalka, who is wrapping up a five-month expedition. Volkov will stay on the space station until March, when he will come back to Earth with NASA astronaut Scott Kelly and Russian cosmonaut Mikhail Kornienko after nearly one year in space. The space station residents will relocate a Soyuz capsule to another docking port Friday to configure the complex for the arrival of next week’s crew rotation flight. Japan plans at least four more HTV missions to service the space station through 2020, and NASA is negotiating with the Japan Aerospace Exploration Agency for additional HTV flights in the next decade.